Ever since a certain TV celebrity was elected POTUS, ‘fake news’ has been crowding our daily feeds. But, as much as this man can be blamed for a lot of what’s wrong with the world, sadly the rise in fake news can’t be attributed to him alone. We all love a bit of personal propaganda, don’t we? Think about all those stunning Insta-holiday images, extraordinary Hallmark-inducing motivational quotes and our greatest moments shared with all and sundry, as we attempt to put our best selves forward. Surely no-one’s life is this perfect? Our industry has been peddling fake news since the beginning of brands. Indeed, for many years it was what advertising was all about. In the early 1950s, Liggett & Myers’ L&M Filters were, astonishingly, "Just what the doctor ordered". More recently, a Mexican beer ad showed a beautifully generic beach sunset and proclaimed "This is living" – the implication being that life around the billboard, perhaps in a poor neighbourhood, isn’t. Consumers today are too shrewd to buy into the idea that a Mexican beer is the route to instant holiday happiness. When they’re fresh out of imagination, brands choose to mimic their competition, the result being shelves full of clichéd fake images of whiter teeth, shiny hair and perfect, younger-looking skin. Few seem to realise consumers are brilliant at spotting lazy thinking. They know when ‘New, even better recipe’ really means ‘Same old stuff’. But all is not lost. Luckily for us, not all news is fake. The brands (and people) that focus on ownable and unique truths, and express these through inventive and memorable ideas, are those that cut through. Especially now, where often only the best and the cheapest brands win. The dull, dopey, samey brand stuck in the middle loses out. Brands need to communicate a meaning­ful difference. They must provoke reactions from consumers based on real substance, often at the expense of the accepted rules of the game. You need fresh eyes to crack old problems. Do not trust people who are specialists in just one category or market. Look for what author Adam Morgan calls "kickers and denters", who instinctively ignore ‘the rules’ and will walk over broken glass to get brands seen and heard. Only big ideas have the substance to effort­lessly extend beyond brand graphics into wider communications. Big ideas can fly (and that’s not fake news). Find your truth, shout it from the rooftops and people will come. Most of all, remember no-one likes a faker. No – we don’t feel it adds much value to smaller independent agencies. At best, an all-knowing force that will maximise the happiness of all humans, by doing its work quietly. Ensuring we feel still in control of our own destiny. The worst that can happen? We live in the sequel of Will Smith’s I, Robot. Not necessarily change, but do more of. Firstly, creatively keep exploring and pushing the envelope. Secondly, seek more close collaborations with other creative teams and agencies. We enjoy it and it creates for more effective and impactful solutions. "Me & EU", by Nathan and Sam Smith – www.meandeu.uk. 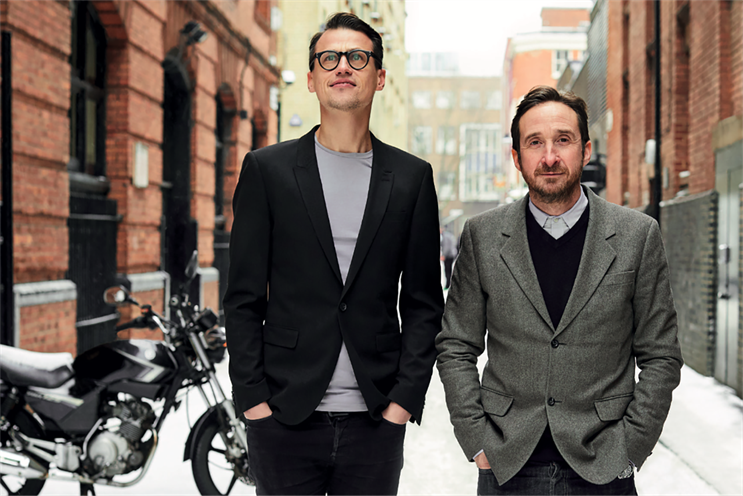 Principals: Garrick Hamm creative partner; Wybe Magermans client services director.